Location: South of 100 Mile House, you turn east on the Horse Lake Road. Follow the signs. 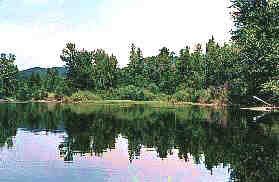 Deka Lake is located northeast of Sheridan Lake. Total distance from 100 Mile House is 56km. Resorts & Campsites: There is no organized campsite on this 14km long lake, however there is bed & breakfast accommodations available and several boat launches at the southwest end of lake (in Deka Lk. Subdivision). Many services are located at nearby Interlakes Corner and Sheridan Lake. Fishing Report: Lake trout are caught up to 10 pounds with rainbow about a pound and a half. Trolled lures can be used for both with spinning gear also effective for the rainbow. Fly fishing is effective on Deka Lake as well. Kokanee have been stocked and are providing enjoyable fishing. Although the lake slows down during hot weather it produces consistently throughout the season. Viewscape: With high fir and spruce covered mountains in the distance, this is a wonderful scenic area. Shoreline: The rocky shoreline is often covered with alder and poplar, with some marshy areas in the narrows. There is access to Sulphurous Lake by water.